Gabriel Consulting Group recently surveyed 450 data center and IT staff members in various organizations, from SMBs to large multinational companies, on their reactions to Oracle announcing its drop of development support for Intel Itanium. About 94% of them are Oracle customers. This is what they had to say. In their announcement, Oracle said that Intel management told them that Itanium wasn't Intel's focus moving forward and that Intel considers Itanium an "end of life" processor. Intel denied Oracle's account, which prompted Oracle to double down and say that neither Intel nor HP are being straight with their customers. 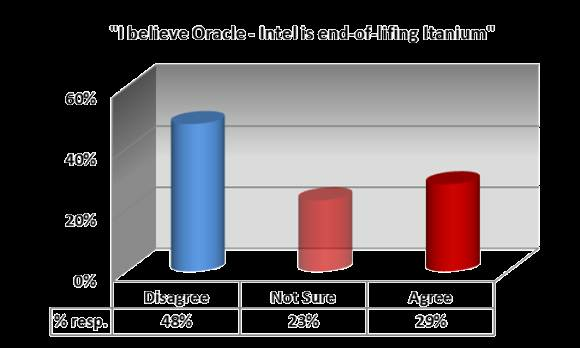 As you can see from the graph above, most customers aren't buying Oracle's version of the truth.